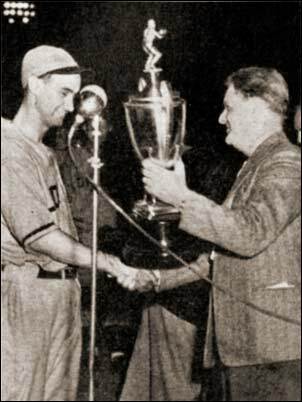 Claire Van Horne, manager of the London Majors, accepts the trophy from Lloyd Douglas, President of the Canadian NBC operations, for winning the championship of the National Baseball Congress of Canada. Majors defeated Kingston Ponies 7-2 in the final game of a six-team competition to take the Canadian title. A four-run rally in the 8th inning secured the win for London before a crowd of 4,300. Majors represented the Intercounty League, Stratford Nationals, from Western Ontario counties, Toronto Mahers, winners of the Toronto district playoffs, Kingston Ponies of the Central Ontario area, and Toronto Tip Tops the 1943 finalists, and Copper Cliff representing the North.